Some random experiments with front wheel drive bikes. 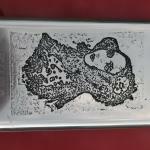 The first iteration is based on Tom Traylor's designs. As with the SWB project I am looking for a bike that I can ultimately try and put in a full fairing. With the short wheelbase bike I ran into a lot of design issues that were addressed by the FWD moving bottom bracket configuration. The FWD MBB design simplifies the drive train a great deal. 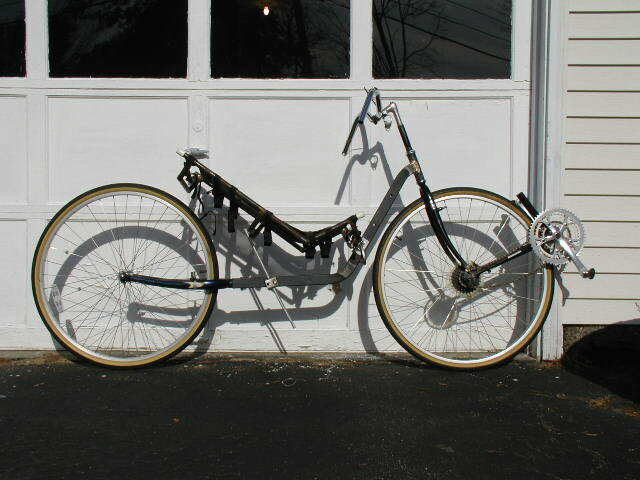 It also simplifies seat design and placement as you don't have to route the chain around it. Finally, there is no worry about heel-wheel clearance so you can have much bigger front wheel size and a lower bottom bracket. 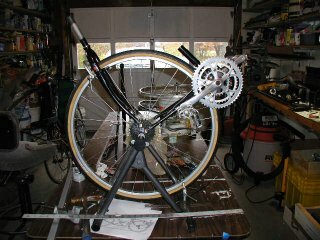 I began with the drive assembly; I cut the chain stays down so that the clearance from bottom bracket shell to tire was about 1/2". This will allow me to sit as low as possible behind the front drive wheel. Since this will be a 700×700 bike that will be important, as my inseam is only so long. I also needed a front wheel for the back of this bike. I had all the parts so I decided to give wheel building a try. 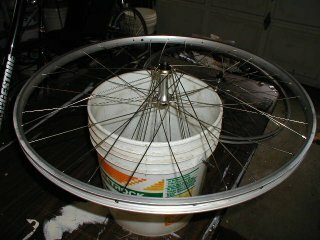 With the help of Sheldon Brown's Wheel Building page, I did a pretty good job of it. I used square tubing for the frame. I like working with square tuning even though there is a slight weight penalty. In this case the stock came from a universal gym machine and it had some nice bends in it that I was able to take advantage of. 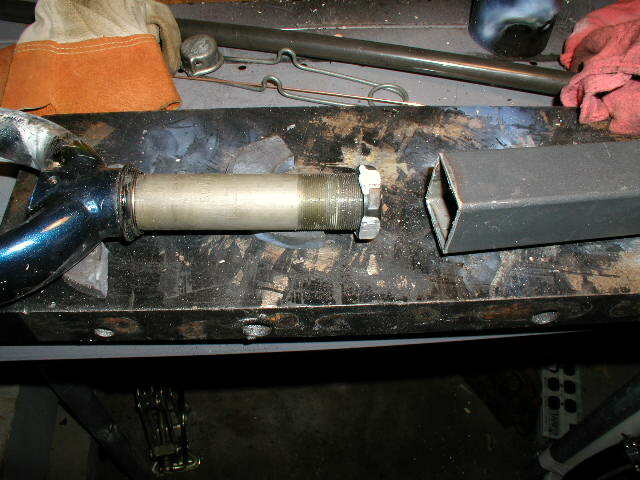 The rear fork is from a Trek Mountain bike, I squared off the nut and pinned it into the frame with a bolt. 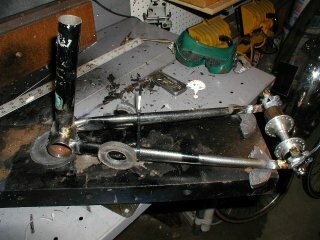 Once I get the seat worked out I'll move the rear wheel forward as much as possible and weld the fork in place. 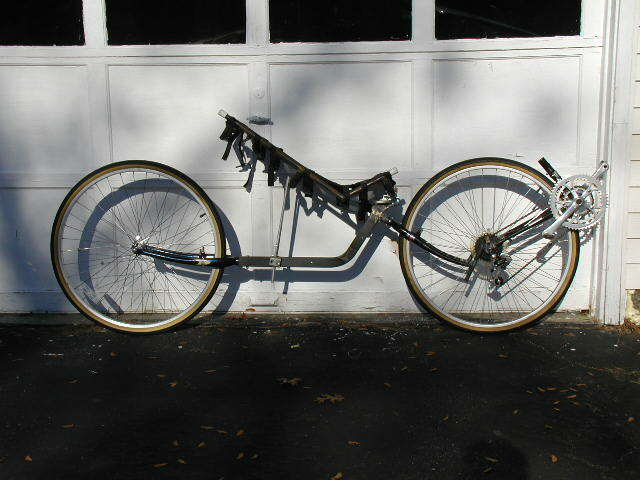 Here's the bike in a early "ride able" state. I mounted a copy of a Ryan seat that I made years ago for another bike project and gave it a try. It doesn't work very well, I can only make the slightest turns without my feet coming off the pedals and the front wheel contacts the backs of my thighs on tight turns. 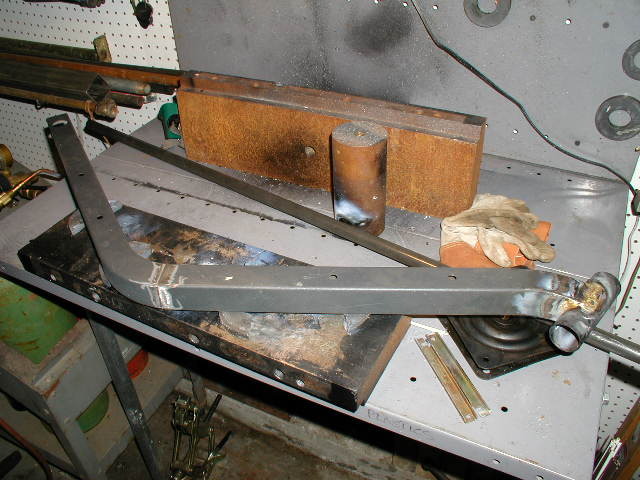 I am going to cut and re-weld the frame to Tom Traylor's suggested geometry of 62 deg. head angle, and a 4-4.5" trail with near 0 offset. I did some additional research on FWB MBB design and came across some comments concerning side stresses on ones knees. I had some issues with knee pain a few years back that didn't resolve until I switched to a clip less system with full float (SpeedPlay Frogs) so I am particularly sensitive to knee issues. It hadn't occurred to me, but of course a FWD MBB would tend to increase the likelihood of nasty stresses on the knees. Still, I have always been curious about the Flevo so I figured to make one more experiment before returning to the drawing board. The result is pictured below. This bike was ride-able, but only just. I'm sure I could have improved with practice. However, as was true with my Ryan with it's under seat steering, I don't think I would ever have reached the same level of comfort I have on the Tour Easy.